Definition at line 61 of file DiagnosticPrinter.h. Definition at line 66 of file DiagnosticPrinter.h. 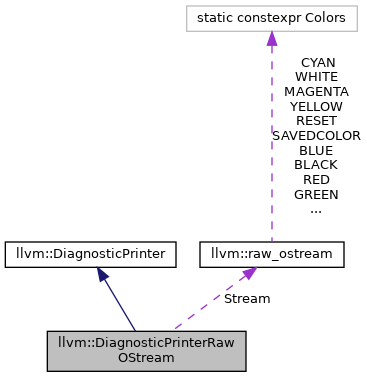 References C, N, llvm::DiagnosticPrinter::operator<<(), and P.
Definition at line 22 of file DiagnosticPrinter.cpp. Definition at line 27 of file DiagnosticPrinter.cpp. Definition at line 32 of file DiagnosticPrinter.cpp. Definition at line 37 of file DiagnosticPrinter.cpp. Definition at line 42 of file DiagnosticPrinter.cpp. Definition at line 47 of file DiagnosticPrinter.cpp. Definition at line 53 of file DiagnosticPrinter.cpp. Definition at line 57 of file DiagnosticPrinter.cpp. Definition at line 62 of file DiagnosticPrinter.cpp. Definition at line 68 of file DiagnosticPrinter.cpp. Definition at line 73 of file DiagnosticPrinter.cpp. Definition at line 78 of file DiagnosticPrinter.cpp. Definition at line 83 of file DiagnosticPrinter.cpp. Definition at line 88 of file DiagnosticPrinter.cpp. Definition at line 93 of file DiagnosticPrinter.cpp. Definition at line 99 of file DiagnosticPrinter.cpp. Definition at line 104 of file DiagnosticPrinter.cpp. References llvm::Module::getModuleIdentifier(), operator<<(), and Stream. Definition at line 111 of file DiagnosticPrinter.cpp. Definition at line 63 of file DiagnosticPrinter.h.